As someone who is currently, right now petsitting a beautiful Beagle named Charlie (okay, my husband is, he's a petsitter and adores animals, or goes to people's homes to feed myriad pets - let us know if you need us in Sydney 'burbs area), this story has affected me a lot. 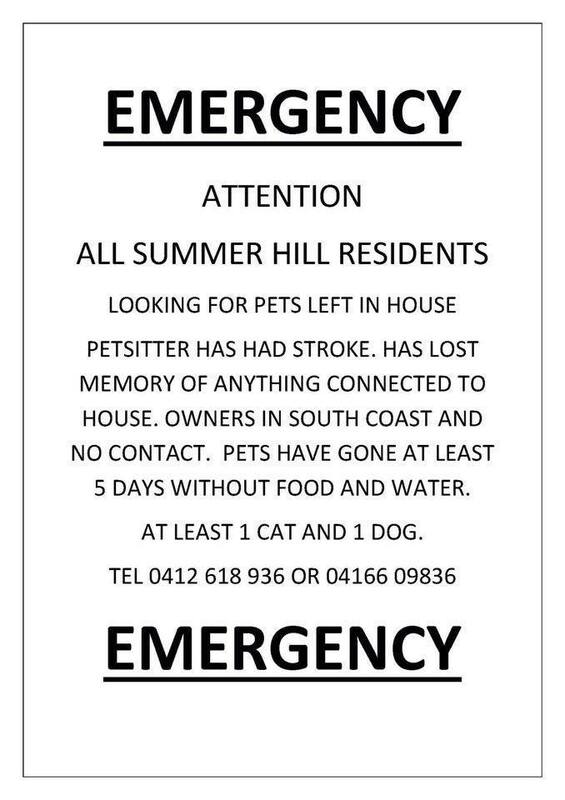 Residents of the Sydney Inner West suburb of Summer Hill are desperately looking for a cat and a dog who may have gone without food or water for around six days by now, after their petsitter suffered a stroke and is now unable to remember where their house is located. The man, known has Tim, was on his way to look after the animals sometime earlier than December 31, 2015 when he suffered a stroke and was taken to hospital, where he is now safe. However, the pets are not able to be located. A Facebook-led search to find the animals is currently underway, after his son Sean discovered his dad was petsitting. Here is the LINK. Please READ this first - for update on current situation. thank you! Police not confirmed it is a couple in their 50's who own the pets - so please be aware that it may be anyone of any age in your group of friends or family - Haberfield & Summer Hill area - so network broadens for search. PLEASE - Note: "a person - or couple - with a cat and a dog or maybe more, likely in Haberfield or Summer Hill" - if you even suspect it is someone you know - CONTACT them and have them try to contact their sitter if his name is Tim. - and let us know if they can't get them so we can help! We will contact the police and ensure that vet assistance is arranged! Locals initially thought they were searching in that Summer Hill area, but it is now thought Tim was walking up Sloane Street, and into Haberfield. Summer Hill Vets: website or phone 02 9797 2555. Facebook group: Summer Hill Pet Search Alert. Also, an interactive map of search efforts is HERE.